Slap Magazine is a free printed and on-line magazine distributed throughout Worcestershire, Herefordshire, Gloucestershire and Warwickshire. Slap Magazine supports Local Arts & Performers by giving them a platform to raise their awareness in the local region. 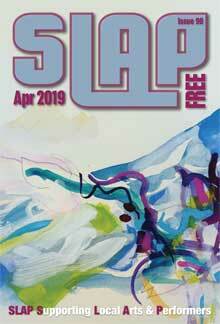 The April 2019 issue of Slap Magazine is now available, read the magazine now. You can view the latest gigs on our event guide. If you wish to add your listing to Slap Magazine please add them using our on-line form, thanks. Find out more information about how to contribute to Slap Magazine. If you wish to place an advert in Slap Magazine you can find out more information. Would you like to recieve a copy of Slap magazine delivered to your door every month? We now offer subscriptions allowing you to subscribe for one year. Each year consits of 11 printed copies, with a double issue for December / January.. Slap Magazine is proud to support Worcester City FC bid to obtain a new stadium based in Worcester. Find out how you can support this cause.